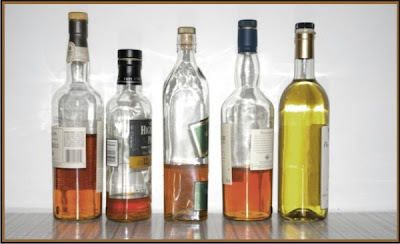 You'll notice one thing right away: they're all a rich orange-brown other than the Whisky Works bottle. In person, the difference is stark: the Whisky Works bottle is very pale, only slightly darker than white wine. Admittedly, the reddish colours in the other bottles might very well be the result of caramel. The Whisky Works bottle says in a lovely italic font that it is free of artificial colouring, so it's safe to assume that that is the colour it's supposed to be. I won't bother photographing the whisky again until it's been in the cask a little while. But remember: I'm going to keep a little of it back so that I'll always have some un-matured whisky to compare. I find it strange that producers use caramel to colour scotch. I often wonder what effect it has on taste (though I'm told its very little). I also wonder why the most intensely flavoured scotches tend to be the lightest in colour, whereas some of the darkest tend towards poseurdom. Oh the mysteries of scotch. The most peculiarly flavoured Scotch I've had was a Glen Turret. It was like butter, and very pale. Some of the Scapas I've had have been quite pale as well, and strong. Maybe the producers of smokier whiskies feel their product should be darker and add caramel to make it look burnt to match the smoke taste. Maybe it's not as common as I've been led to believe.